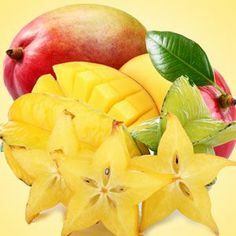 This entry was posted in bath and body, bath products, cosmetic recipes, facial masks, Natures Garden and tagged advantages of turmeric, bath and body, bath and body products, bath and body recipes, benefits of turmeric, Bentonite Clay Powder, candle making supplies, candlemaking supplies, cold process soap, cold process soap scents, cosmetic classes, cosmetic making supplies, cosmetic recipes, cosmetic tutorials, cp soap, Crafts, diy, face mask, facial mask, facial masks with turmeric, fragrance oil, fragrance oils, fragrance oils for soap, handcrafted cosmetics, handmade face mask, homemade, homemade candles, homemade soap, how to use turmeric, natures garden, natures garden candle supplies, natures garden cosmetics, soap making supplies, soapmaking supplies, turmeric, turmeric benefits, turmeric face mask recipe, turmeric ground, turmeric health benefits skin, turmeric ideas, turmeric in bath and body products, turmeric in cosmetics, turmeric powder, turmeric powder uses, turmeric recipes, turmeric uses, vegetable glycerin, vitamin e, ways to use turmeric, what is turmeric, where do i buy bentonite clay, where do i buy bulk turmeric powder, wholesale bentonite clay, wholesale fragrance oils, wholesale turmeric powder on April 27, 2018 by Deborah Ward. Today, Nature’s Garden is proud to introduce their newest facial recipe, our Turmeric Face Mask Recipe. We know that turmeric is popular in many Indian dishes, however, Turmeric is wonderful for face masks, scrubs, lotions or even facial toners. Nowadays, facial masks are incredibly popular and they are really so easy to make. It almost seems a shame to buy them when you can create your very own at hardly any cost at all. Below, I have given you a brief rundown on turmeric and all its uses and benefits, however, there is so much more! If you want to learn more about turmeric click here to view our free turmeric class. Now, let me tell you a little bit about the recipe. Besides turmeric, this recipe also includes bentonite clay powder and Vitamin E. Only a few ingredients that pack a powerful punch of skin benefits. This face mask would be a wonderful addition to your bath and body product line. Or, even to just create for girlfriends and family members. We are sure they will love it just as much as we do. Turmeric, or Curcuma longa, comes from the rhizomes (or roots) of a herbaceous perennial plant of the ginger family. It is native to India and Southeast Asia. In Asia, turmeric is known as “manjal” or even “kasturi manjal”. Much like its cousin the ginger root, Turmeric can be grated and used fresh. Turmeric rhizomes, when not used fresh, will be boiled in water, dried in hot ovens, and then they are ground into the powder that we are all familiar with. This perennial plants can grow up to over 3 feet tall. 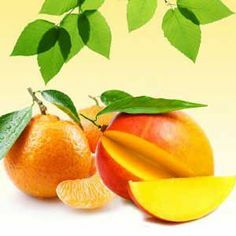 It has cylinder-type roots that range in color from yellow to orange. Heavy branches grow up from the roots. Turmeric is most commonly known as a spice used in cooking. If you are familiar with Middle East or South Asian cuisine, then you know the spice very well. With its peppery-like flavor and earthy, mustard-like aroma, it is a popular addition to curries, stocks and sauces. However, turmeric has many beneficial properties in natural cosmetics. This bright, golden orange powder can be used as a natural colorant in soap. Turmeric has been found to heal and prevent dry skin, treat skin conditions such as eczema, psoriasis, and acne, and has anti-aging properties. Turmeric powder can be used in any kind of bath and body product. These include soap, hair conditioners, facial masks, scrubs, lotions, ointments, creams, bath teas, face toners, and even in bath bombs. Did you know that in India, turmeric is considered holy? For centuries this powder has been used in various Hindu ceremonies as well as being used in every part of Indian religious ceremonies and even in weddings. Plus, this powder is also a wonderful natural dye. Specifically for Saris and Buddhist monks’ robes. One last interesting fact, paper steeped in turmeric can be used to create pH level strips. If you are a soaper and are familiar with pH testing, the0n you know exactly what I am talking about. Like stated above, Turmeric is most well know for its culinary uses, however, this versatile herb has many more uses and benefits. Turmeric is very popular in the medical field. In fact, Turmeric has been used in medicine for thousands of years and is a major part of Ayurveda or Siddha (Indian traditional medicine). This powerful herb is used to treat problems such as, indigestion, throat infections, common colds, or liver ailments. Turmeric can also be used topically to cleanse wounds or treat skin sores. There are many other conditions that can be treated using turmeric. Rheumatoid arthritis, fibromyalgia and water retention are a few. Turmeric can even benefit the heart by lowering bad cholesterol and blood sugar. For women, turmeric does work to help with menstrual problems and water retention. Also, this powder has many antioxidant and anti-inflammatory properties. These properties actually work to reduce brain inflation, which is believed to be the main cause of Alzheimer’s Disease. So, essentially, turmeric can work to delay the onset of this horrible disease. You can use turmeric in all kinds of bath and body products. From face masks to shampoo! You can create a paste of turmeric to help lighten or prevent stretch marks. This powder is wonderful at moisturizing the hair or preventing hair loss. Also, turmeric can treat scalp conditions such as inflammation, flaking and itchiness. In skin care, this herb works to treat such conditions as acne, eczema and psoriasis. You can create toners, lotions, bath bombs, facial masks, conditioners, why, the list is endless! So you see, this bright, yellow orange colored powder is incredibly versatile in any type of form. Let’s now move onto our recipe! So let’s begin now with our turmeric face mask! First, we are going to start with the turmeric powder. So, get your scale out. You will also be using a medium sized bowl. Have your scale tared out. Then, go ahead and weigh out 96 grams of your turmeric powder. First, let’s talk about Bentonite Clay Powder. Bentonite is a wonderful addition to any face mask! This type of clay, when used in face masks, helps clean impurities from the skin. When used in soaps, bentonite is good at treating oily skin. Also, when used in bath bombs, it helps harden them. In addition, bentonite is useful in thickening lotions. So, now we are going to weigh out the bentonite. You will add the clay to the same bowl you have your turmeric powder in. Tare out your scale and to the medium bowl, add 224 grams of bentonite clay. Next, mix the two ingredients together until everything seems evenly dispersed. The next ingredient we will be adding is Vitamin E. Vitamin E from Nature’s Garden comes in the purest form, is also known as Tocepherol T-50. This is not tocopherol acetate (the form found in many vitamin E capsules). Vitamin E is a wonderful antioxidant and is fabulous for your skin. So, to the bowl containing the powdered ingredients, you will be adding your Vitamin E oil. Using a disposable pipette you will add 24 drops of the Vitamin E oil right on top of the powder. Finally, use a spoon or spatula to mix the ingredients together. For this recipe, we decided to package the powder portion of the face mask and the vegetable glycerin separately. We chose to create the facial mask recipe this way for a couple of reasons. First, creating the facial mask mixture separately without the water you will not need to add a preservative. In addition, you will be able to prepare a quick product for your customers. This recipe can be made in just a few minutes. Each 2 ounce jar will create approximately 4 facial masks. Now that your powdered portion is complete, you can begin packaging this portion of the facial mask. So, using a spoon, fill each of your 2 ounce white double wall jars and place a lid on each jar. The next part of our recipe is the vegetable glycerin. Vegetable Glycerin is a humectant, meaning, it draws moisture to your skin. So by adding vegetable glycerin to this recipe, your skin will be left feeling soft and hydrated. Next,we will prepare the liquid portion of the facial mask. Water, while it is an ingredient in the recipe, will not be used until you are ready mix and apply the face mask. So, we will prepare eight 1/2 ounce bottles for the vegetable glycerin. To each bottle, add 12 grams of the vegetable glycerin and cap them with the white ribbed lids. As we talked about previously, by mixing this mask on an as needed basis, it will prolong the shelf life and can be made quickly when needed. With that being said, let’s talk about using the mask. It is really a simple process. Also, if you are selling this mask as a product, you can sell the jar and bottle as a set and label it with instructions. Finally, you are ready to use your face mask! You will need one of your jars of powder and a bottle of the vegetable glycerin. Lastly, you will need a small mixing bowl. Starting with the powdered mixture. First, to the small bowl, add about 1 Tablespoon of the powder. Next, you will add about 1/2 teaspoon of the vegetable glycerin to the powder. Finally, you will add 2 Tablespoons of distilled water. Mix this together thoroughly. Once your ingredients are mixed together nicely, apply a thin layer to your face and kick back and relax for a few. Once the mask has hardened, you can rinse your face off in warm water and see how soft and glowing your skin looks and feels! As always, Nature’s Garden is here to help keep you beautiful as naturally as possible. So we insist that you treat yourself! Apply a mask, relax with a turmeric hot toddy, a magazine and some quiet music. Let your cares go for a while and allow the turmeric face mask do its job! Well, we now know the benefits we can get from turmeric powder on our face. So, how about we take a look at some recipes that we can eat! Just follow this link to Allrecipes.com to see just how many types of dishes turmeric is used in. There are literally hundreds of recipes that incorporate turmeric in them. One very popular and well-known way to use turmeric is always curry! Curry is actually not a dish as some people think, but a mixture of many different spices and herbs, turmeric being one of them. The use of the term “curry” is generally limited to dishes prepared in a sauce that is made with the mixture of spices. Using turmeric in recipes isn’t strictly for savory dishes. Sfoof is a traditional Lebanese dessert cake that uses turmeric. There are also smoothie recipes that use turmeric in them and even in hot drinks that are soothing to your soul. So as you can see, this spice can be added to any type of recipe, internationally or just in your simple everyday drinks! Some people add it for the taste or color, and there are some people that like the idea of using a natural herb in their diet. Want to show off all your fun creations that you have made using Nature’s Garden products? Whether you used one or a ton of our products in your recipes, give us a shout out and show off what you made! We love hearing from all of our customers! You can find us on Instagram (@ngscents) Twitter (@ngscents) and on Facebook! Nature’s Garden sells turmeric powder for external use only. We do not sell it as a food item. The information above talks about how great turmeric is for many industries, however we only sell it for external use. We provide this data for educational purposes only. Nothing in this article is to be construed as medical advice. Please consult your doctor before using this product or any of this information for treatment purposes. This entry was posted in bubble bar recipe, Bubble Bars, Fragrance Oils, free recipe, Natures Garden and tagged bath and body recipe, bubble bar, bubble bar colorants, bubble bar recipe, bulk bubble bar making supplies atlanta, buy fragrance oils, Colored Dough, Corn Starch, Cream of Tartar, Diamond Dust Mica Pigment, discounted fragrance oils, discounted soap making supplies, diy bubble bars, fragrance oil, fragrance oils, free craft recipes, Galaxy Bubble Bar Recipe, galaxy bubble bars, grape candy scent, Grape Happy Camper Candy Fragrance Oil, grape scented bubble bars, homemade bubble bar recipe, how to color a bubble bar, how to make bubble bars, mica, natures garden, Natures Garden Apron, Neon Blue FUN Soap Colorant, Neon Pink FUN Soap Colorant, neon soap colorants, Safety Gloves, Safety Mask, Safflower Oil, scoopable bubble bars, sls alternatives, sls alternatives for sensitive skin, Small Stainless Steel Scoop, soap dyes wholesale, soap making supplies Ohio, soap suppliers ohio, soap suppliers washington, soap supplies texas, Sodium Bicarbonate- Baking Soda, Sodium Cocoyl Isethionate, ultramarine soap dyes, Ultramarine Violet FUN Soap Colorant, vegetable glycerin, wholesale baking soda, wholesale carrier oils, wholesale cream of tartar, wholesale fragrance oils, wholesale fragrances ohio, wholesale safflower oil, wholesale sci, wholesale suppliers soap making ingredients oh, wholesale supplies for bubble bars, wholesale vegetable glycerin on September 6, 2017 by Deborah Ward. Galaxy Bubble Bar Recipe is a colorful grape candy scented bubble bath recipe from Natures Garden. These easy to make and super cute bubble bars will make a great addition to any bath and body product line! Whether you choose to use them for your customers, yourself, or to make bath time fun for the kids, this is a recipe that is great for those of all ages! Each scoop of the Galaxy Bubble Bars will show off the three colors. With vibrant colors and a wonderful grape scent, using these bubble bars with make bath time a hit. In addition, we have added diamond dust mica for a little sparkle and shine! You could skip that step, but who doesn’t love sparkles? So, when you are ready, look below to create this fragrance fun bubble bath recipe! We were inspired by an actual ice cream recipe from Some of This and That! Who doesn’t love ice cream? Now, on their website, you will find not only a list of ingredients but also steps on how to make their homemade Galaxy ice cream. Make sure to check out their website and look at their recipe! So, after you make these Galaxy bubble bars, your tummy is rumbling, give the ice cream a try! Either way, you can’t go wrong! Do not forget to check out Some of This and That’s Homemade Galaxy Ice Cream. Prior to starting it is important to be prepared. You will really want to make sure your work space is clean and sanitized before you begin creating your bubble bars. We also recommend wearing an apron, your safety gloves, a face mask, and a hair net while preparing this recipe. Having a clean and sanitized work space will assure to keep your Galaxy bubble bars nice and clean. In addition, get out any ingredients or equipment that you will be using and place them in your work area. Having everything you need at an arm’s reach will help the process go more quickly and smoothly. First, you are going to weigh out your dry ingredients. In total, you will have four dry ingredients you will be weighing out. You can use measuring cups but we recommend using a scale that will allow you to weigh in grams. In a mixing bowl, you will want to add 460 grams of baking soda, 410 grams of sodium cocoyl isethionate, 72 grams of corn starch, and 224 grams of cream of tartar. Next, you want to mix together all the ingredients. This can be done with a mixing spoon, but we always find it easier to use our hands. Also, use your hands to break up any clumps you may find throughout the powder mixture. Clumps will not be your friend during this process. If you have never used sodium cocoyl isethionate or SCI for short, you should definitely give it a try! Sodium cocoyl isethionate will leave your skin feeling super soft. Also, sodium cocoyl isethionate is great for sensitive skin. We highly recommend giving sodium cocoyl isethionate a try. It is a wonderful SLS alternative that truly is amazing! Next, you are going to be preparing your wet ingredients. For this step, you will have a total of three wet ingredients. So, get your bowl of dry ingredients and tare the weight on the scale. Alternatively, you could weigh these ingredients in a separate bowl before adding it to the dry ingredients. This could be helpful for those worried about pouring too much, as it could alter your recipe. So, in a large mixing bowl, blend 200 grams of your vegetable glycerin, 24 grams of the safflower oil, and 14 grams of Natures Garden’s Grape Happy Camper Fragrance Oil. Once again, while you can use the volume measurements above, we highly recommend using weighted measurements. By weighing your ingredients in grams, you will get a more accurate measurement and an overall better outcome. Now, add your wet ingredients to the mixing bowl containing the dry powdered ingredients. Once again, go ahead and use your hands to mix the ingredients. Also, make sure you get all the clumps out. Keep mixing the wet and dry ingredients until you get a dough like consistency. You want to make sure your dough is not too crumbly. If it becomes crumbly, you can add a little bit more vegetable glycerin. However, you want to be very careful when adding the vegetable glycerin. If you end up adding too much vegetable glycerin, your dough will become too wet and the recipe may not dry properly. Make sure you are super careful when measuring and mixing your dry and wet ingredients. Next, we are going to separate the bubble bar dough you just made into three bowls. So, you will need three of your mixing bowls. In a later step, we will be adding a different colorant to each bowl. Although for now, you just need to make sure while separating the dough into three bowls, the are equally divided to include 1/3 in each bowl. They don’t have to be exactly even, just a rough 1/3 in each bowl will work. However don’t let your big mixing bowl go too far, you’ll need it again in a later step. Now for the fun part! Start getting excited! Next, we will be adding color. In each of the three bowls, you will be adding one of Natures Garden’s three FUN Soap Colorants. In the first bowl, add five grams of neon blue FUN Soap Colorant. Then, use your hands to mix the blue colorant into the bubble bar dough. Now, with clean gloves, add five grams of Natures Garden’s ultramarine violet FUN Soap Colorant to the second bowl. Lastly, in your third bowl, add five grams of the neon pink soap colorant. 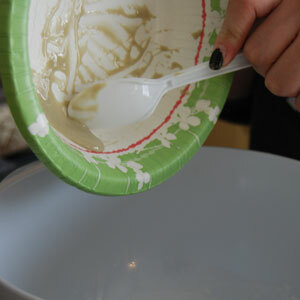 While wearing clean gloves, mix the colorants into the final bowl of dough. Once you have mixed each portion of dough, roll them into a ball and place each one back in their bowl. Remember you may need to change gloves for each color. This will prevent the colors from mixing with each other prematurely. Now, you will need the large bowl you were using earlier in the recipe. Go ahead and place your pink bubble bar dough, blue dough, and purple dough ball in your large bowl. Place them next to each other in the bowl but not directly on top of each other. Then, press down on the dough balls to flatten each color dough ball completely. You can overlap slightly as you press on each ball. The goal is to fill the bowl completely. When we begin scooping we will scoop across the bowl to allow us to get a little bit of each color. Next, scoop the dough using your small stainless steel scooper. While scooping the dough with your stainless steel ice cream scooper, make sure you get a little bit of the pink dough, the blue dough, and the purple dough color in the ice cream scoop. Then, release each scoop onto a piece of parchment paper or on your silicone baking mat. This recipe will make about thirty of the small ice cream scoops. Galaxy Bubble Bar Recipe Let’s Add Sparkle! Now, let’s add some sparkle! We used Natures Garden Diamond Dust Mica Pigment to add some shimmer to the Galaxy bubble bars. This will give your handcrafted bubble bars a silvery white sparkle. While this is totally optional, we thought it was the perfect finishing touch to really give the bubble bars the true Galaxy feel. So, sprinkle your bubble bar scoops with Natures Garden diamond dust mica powder. While making the recipe, we used about two grams of diamond dust pigment. But you can use as much or as little as you would like. Finally, you will just need to let your bubble bars setup. I know you want to use them right away, but you will need to be patient. It can take a few days and in some cases as long as a week for them to setup. While setup will not take as long a typical rolled bubble bar, for us they just took a few days. It all depends on the environment they are setting up in. You will know they are ready when they feel completely dry. If you try to pick your bubble bars up too soon, they may fall apart in your hands. So, make sure you allow a few days for the bubble bars to completely harden before moving them or packaging them. Your finished product should turn out like the picture shown. Look at how awesome and vibrant the colors turn out! The diamond dust mica powder adds a great look to these bubble bars. Lastly, I bet you can’t wait to try them! I know I couldn’t! I was so excited to see what they looked like in water, I couldn’t wait to get home and see! So, I crumbled one into a bowl, here is a picture of a finished Galaxy bubble bar in a little water. When using your bubble bars at home, crumble a couple of your hardened scoops under your warm running bath water. Not only will it leave your water a beautiful magenta color, it will provide for a nice and relaxing bubble bath. Also, since one of the dry ingredients is sodium cocoyl isethionate, your skin will be left feeling soft. Now, sit back and enjoy a shimmering, grape scented bubble bath! Try it out and see what the rave is all about with our Galaxy bubble bar recipe. You may even decide you want to try other bubble bar recipes from Natures Garden! Well, for even more candle, soap, and cosmetic making ideas, check out our recipe box found here. 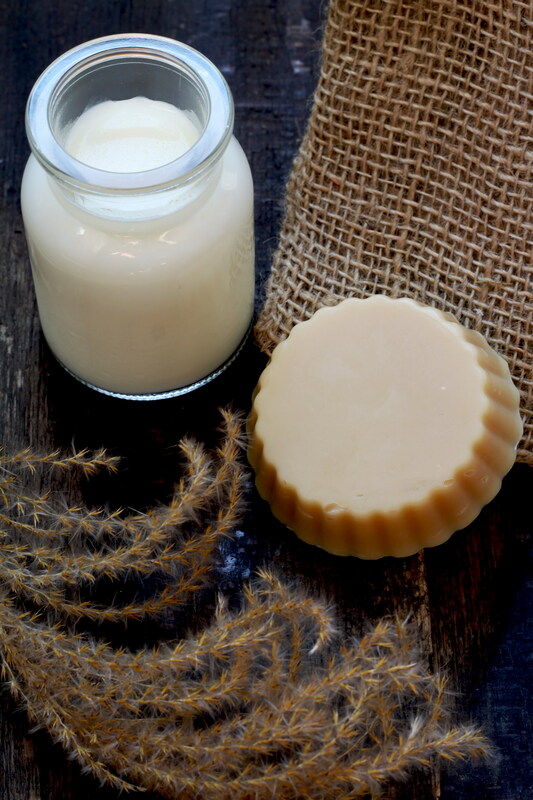 In our recipe box, you will find a variety of handcrafted bath and body recipes as well as free downloadable candle making classes and soap making classes. Have you tried our Galaxy Bubble Bar Recipe? Or, maybe you changed up the colors? We would love to see the bubble bar scoops that you have created! Post your bubble bar pictures on our Instagram or Twitter page! You can find us @ngscents. As always, you can also post your pictures to our Facebook page as well. We hope your Galaxy bubble bars turn out great and you have a blast making them! Also, we are always here to help and to answer any questions you may have. We hope to see pictures of your finished bath and body products soon! This entry was posted in bath and body, bath products, Fragrance Oils, Natures Garden, Natures Garden Fragrance Oils, Soap making supplies, Uncategorized and tagged bars, benefits, carrot powder, coloring properties, fragrance oils, homemade soap, learning, measure, melt and pour, melt and pour soap base, molds, orange, orange oxide, paste, Pinterest, poured beautifully, powders, pumpkin, pumpkin fragrance oil, pumpkin frangrance oils, pumpkin mold, pumpkin recipes, pumpkin seed oil, pumpkin soap mold, pumpkin walnut biscotti, recipe, recipes, scrubs, silicone soap mold, skin loving benefits, soap, solid pumpkin sugar scrubs, sugar, sugar recipes, sugar scubs, Sweet Almond Oil, turmeric, turmeric ground, turmeric powder, vegetable glycerin on November 9, 2015 by Deborah Ward. What a fun time I had with the Pumpkin Sugar Scrubs Recipe as my first solo attempt at melt and pour homemade soap making. We have a wide variety of pumpkin products such as molds, pumpkin fragrance oils, pumpkin powders, and even pumpkin recipes to satisfy your craving for this seasonal scent. For now, I’m all about making melt and pour soaps and learning all I can about the different products here at Natures Garden, learning the techniques, and trying out the fabulous recipes. I decided that making small, solid pumpkin sugar scrubs as my first official project was appropriate for this time of year. 1. Place the silicone pumpkin soap mold off to the side. 2. Measure out your powders! I did this by placing one of my glass measuring containers on the scale, taring it to 0, then adding my powders one at a time (tare in between the powders if you’d prefer not to do any math). 3. Add 30g vegetable glycerin to your small glass bowl with your powders and stir until it is thoroughly mixed and you have created a paste free of lumps. Place to the side. 4. Measure out your sugar and place to the side. 5. Measure out your oils. 6. Cut 175g of your melt and pour base and place in you microwavable bowl. 7. Microwave your soap in 30 second intervals, stirring in between, making sure it is melted. If you have a more powerful microwave, you can do it for shorter bursts of time. 8. Once that soap is completely melted, add your Pumpkin Walnut Biscotti Fragrance oil and your sweet almond and pumpkin seed oil; stir thoroughly. 9. 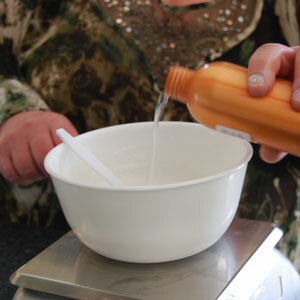 Then pour your powder paste and add your 20 drops of orange oxide into the bowl all while its wet. 10. Then add the sugar and stir, stir, stir. 11. Once you’ve completely mixed your soap, oils, and sugar pour mixture into the mold and allow the little pumpkin bars (this recipe makes about 24) to set up for 4 hours. Ta-da! Things got a little weird for me around step 11. As I was mixing the mixture, it began to harden. As you will see in the picture, I attempted to pack the mold versus pouring. I decided to go ahead and re-heat it in the microwave for another 30 seconds. When I took it out, it was a thick liquid that I stirred with the spatula (just to remix) and then began to poor into the mold. It poured beautifully into each mold. As excited as I was that this project seemed to turn out just right , I immediately decided it was time to put them to the true test. I used a couple of these and they worked really well! The bar held its shape despite the fact that anytime you add water to sugar, it breaks it down. I hope you have as much fun as I did using this recipe. This entry was posted in bath and body, bath products, citrus notes, melt and pour soap, Natures Garden, Natures Garden Wholesale, red Moroccan clay, Rose Clay, soap, soap colorants, Soap making supplies and tagged brown soap, carrot powder, clay powder, colorant combinations, colorant concentration, colorful soap, coloring soap with clay, coloring soaps, gradient soap, herbal powders in soap, herbs in soap, homemade soap, layered soap, lemon peel powder, making soap in the microwave, melt and pour soap, natural soap colorants, one pound loaf mold, orange peel powder, pink soap, pretty soap, red Moroccan clay, red soap, rose clay powder, shea butter melt and pour, soap colorants, soap from scratch, soap photography, soaping supplies, soapmaking, soapmaking for beginners, soapmaking supplies, striped soap, vegetable glycerin on September 27, 2015 by Deborah Ward. Hi, there! It’s me, Katie, again. I’ve already told you about my first attempt at soapmaking. and guess what? I made more soap! Or at least tried to. This time I decided to experiment with natural soap colorants in melt and pour soap. (Different soap processes can affect natural colorants differently, but you’re generally OK with melt and pour- read the pages on the colorants for more information.) I wanted to make a color gradient with natural soap colorants, and I had the following powders: Red Moroccan Clay Powder, Orange Peel Powder, Carrot Powder, Rose Clay Powder, and Lemon Peel Powder. I used red clay, orange peel, and carrot in my first soap, and I got rose clay and lemon peel for a pink lemonade soap idea that I had (didn’t work out, going to try again- that blog will be coming soon!). Out of habit, I had originally thought the lemon peel mixture would be the lightest- yellow, right? But it was actually a light brown. Hmm. Well. My eyes didn’t lie. So I lined the powders up this way since it seemed to be the most aesthetically pleasing- looked like a gradient and that’s what I was going for. This time, I used the microwave for my melting and wow, that was so much faster and easier than trying to use the stove. I still wasn’t 100% sure on my carrot, orange, and lemon powders being in the correct order for a proper gradient (lemon = yellow, right, brain?) so I put my four squares each of melt and pour (cut up, of course, for easier melting) into three glass containers with spouts and thoroughly stirred in my powder-glycerin mixtures. Lemon was clearly the darkest of the three. It was a close call between carrot and orange, but orange was definitely closer to the color of the lemon powder soap. Well, alright. I had to melt them again because melt and pour isn’t really designed for stopping and taking photos and then I began pouring them into the mold one layer at a time. I poured my carrot layer first and sprayed the top with rubbing alcohol to get rid of air bubbles. I let that sit for.. I’m not sure exactly- about half an hour? It was only 1/5 of a pound so it didn’t take too terribly long to set up. Then I sprayed the top of that layer with rubbing alcohol (it evaporates out- so no worries there) and poured the next layer, sprayed it with rubbing alcohol, and let it set up. I repeated these steps for all five layers. What did I learn? Well, the concentration of your powder is very important in determining coloring. That failed soap I mentioned above? I used the same amount of rose clay powder (and veggie glycerin to color an entire pound of it and you can really tell the difference 5x colorant concentration makes. The red clay layer actually looks closer to the solid-colored soap. Interesting. I think if I made another gradient soap, I would pick one colorant and do the different layers in different concentrations. No guess work when it comes to the proper order that way. It’s also been brought to my attention that certain non-clay powders may have the tendency to oxidize and eventually turn brown. I think they worked well in this soap not to mention the added benefits, but I may stick with clay for colorants in the future. Here’s my first soap side-by-side with my second soap. So cute! Different combinations and different concentrations make different colors. I can’t wait to experiment with this further! This entry was posted in bath and body, bath products, candle fragrance oils, candle making supplies, cold process soap, Fragrance Oils, Natures Garden, Natures Garden Fragrance Oils, Soap making supplies, Uncategorized, wholesale fragrance oils and tagged aroma beads, banana, banana (true), banana fragrance, banana mold, banana scent, bath gels, bath oils, bee pollen powder, body spray, candle coloring, Cavendish banana, cleaning products, cold process soap, color block, diy bath and body, fragrance oil, fragrances for mixing, fresh fruit fragrances, fruit fragrance, homemade bath and body, homemade candles, homemade soap, liquid candle dye, lotion, monkey scent, natural soap colorants, natures garden, no acceleration, perfumes, pure aromas, room spray, scent of a banana, scented candles, scented soap, simple scents, single note scents, slight discoloration, smell like a banana, soap colorant, soap from scratch, soapmaking, vanilla white color stabilizer, vegetable glycerin, yellow banana on September 23, 2015 by Deborah Ward. You’ll never meet a more honest fruit in your life. This aroma is so authentic; it’s bananas. A banana is technically a berry– what?! I had no idea! There are all different kinds of bananas- but the one we’re most familiar with is called a Cavendish banana. And even those are divided into more subspecies. I never knew bananas were so complex- but this scent is spectacularly simple. If you’re bananas about bananas (BANANAS!! ), be sure to check back on the blog for more banana-related-scents. What Does Banana (True) Fragrance Oil Smell Like? A wonderful strong single note of fresh, ripe banana. Great for use by itself or for creative mixing with other fragrances. How Do Our Customers Use Banana (True) Fragrance Oil? Candles, of course! This pure aroma performs perfectly in joy wax and wow wax, and is nice and strong in soy wax. 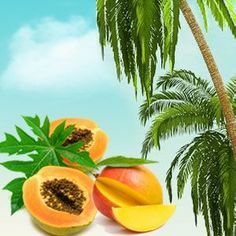 This fruity fragrance is not gel wax compatible. The maximum recommended usage percentage for this simple, strong scent in vegetable waxes and paraffin wax is 10%. Our coloring recommendations for candles are to use 6 drops of yellow liquid candle dye per 4 pounds of wax or shred an ample amount of yellow color block into your melted wax. You want a nice, true yellow for your nice, true banana scent. Remember to never color your candles with crayons–it will clog the wick! Room scents! This authentic aroma comes across nice and strong in aroma beads. The maximum recommended usage percentage for this fresh fragrance in incense and potpourri is 50%. Soaps! The maximum recommended usage percentage for this simple scent in soaps, bath oils, and bath gels is 4%. 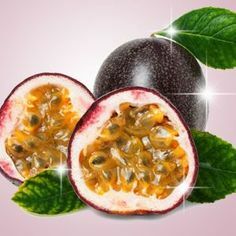 Our cold processing soap testing results found that this true fruit fragrance caused no acceleration, no ricing, no separation, and retained its scent excellently. It did, however, discolor to a light beige. This is possibly due to the 1% vanillin content of the fragrance oil. The higher the vanillin content, the more likely your soap is to discolor to a shade of brown. In this case, it is a very, very, very light shade. (Watch the video or check the fragrance oil page to see the picture!) This means there is also a chance it will slightly discolor your other bath and body products as well. If you’d like to try to correct this, you’re welcome to try our Vanilla White Color Stabilizer– but remember, you are responsible for the results in your finished products. Our coloring recommendations for bubbly banana bath and body products are to use yellow soap colorant in the amount that satisfies you. You’re also welcome to try natural soap colorants- bee pollen powder seems to be the brightest natural yellow. Bee sure to read the description on the page for more information- buzz buzz! (It also may help to wet the powder with vegetable glycerin for more even distribution of your powder throughout your soap.) Never use candle dye in body products- you’ll dye yourself! Wanna make some banana-shaped, banana-scented soaps? Check out the banana molds at flexiblemolds.com. Body products! Banana (True) fragrance performs perfectly in perfumes. The maximum recommended usage percentage for this straightforward scent in lotions and body-sprays is 4%. Cleaning products (not for your body)! The maximum recommended usage percentage for this clean scent in cleaning products is 4%. This entry was posted in bath and body, free recipe, Natures Garden, soap, Soap making supplies, soap recipes and tagged Crafts, crafts with tea tree oil, diy, free recipe, free soap recipes, hemp oil melt and pour soap, hemp oil soap, homemade, homemade soap, how can i make soap, how to make soap, how to use tea tree oil, kaolin clay, melt and pour, melt and pour soap, mp soap, natures garden, smells like tea tree, soap, soap made with tea tree oil, soap making, soap making supplies, soap recipes, tea tree, tea tree oil, tea tree soap, teal soap colorant, uses for tea tree oil, vegetable glycerin, what is tea tree oil on February 23, 2015 by Deborah Ward. Hey all you crafty people out there, we’re bringing you a brand new unique free soap recipe, and it is actually made with amazing tea tree essential oil! Tea Tree Soap! This wonderful soap is made with actual tea tree essential oil, and is sure to delight you and all of your friends and family! Deborah makes this soap for her family to help dry skin during the winter months. So she wanted me to share this recipe with all of you! 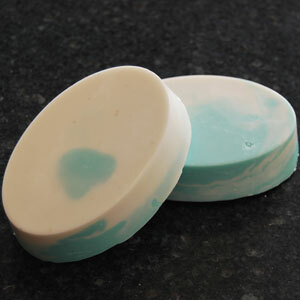 This soap has a beautiful teal and white swirl to it, which is actually achieved very easily! The swirl is brought on by using cosmetic clay. The clay actually works as a barrier between the different soap mixtures, allowing them to swirl around each other! Start by weighing out the amounts of soap for each layer in two separate bowls. (Using glass bowls is better for insulation, it helps the soap to stay melted longer once it has been melted down.) Then go ahead and measure out the amount of Kaolin Clay Powder in a bowl. Once you have measured out your clay, add 15 grams of vegetable glycerin and mix them together thoroughly until they become a paste. Next, go ahead and begin to melt down your soap. When the soap is partially melted, pour the clay and vegetable glycerin paste into one bowl of soap. 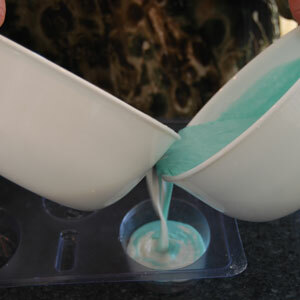 Then add 10 drops of Teal FUN Soap Colorant into the second bowl of soap. Mix each bowl and then continue to melt them. You want to do these steps when the soaps are only partially melted because once it is fully melted, it sets up very fast. The only thing you should have to do when they are completely melted is adding the tea tree oil. Once your soaps are completely melted down, add 7 grams of Tea Tree Australian Essential to one bowl and 7 grams to the second bowl. Mix thoroughly. You’ll want to work quickly at this point as the soap tends to set up very fast. Using your Basic Oval Mold Market Mold, quickly but carefully pour each bowl into the mold at the same time so as to achieve your swirl effect. You will have some soap left over after you have filled the mold. This is so that you will have enough time to fill the molds because the soap sets up very fast. Let your soaps sit until they have completely set up and hardened and then your Tea Tree Soap is ready to use! This is definitely one recipe you just can’t pass up, check out our free Tea Tree Class for all of the wonderful benefits tea tree oil can bring to your skin! Make sure to check out all the rest of our free recipes and classes as well! 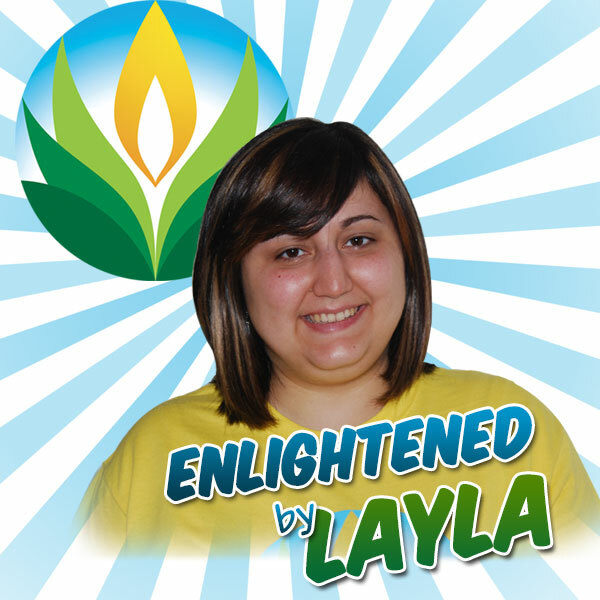 Enjoy this fantastic soap and keep watching for more Enlightened by Layla! This entry was posted in bath and body, bath products, goats milk soap, melt and pour soap, Natures Garden, soap, Soap making supplies and tagged benefits of goat's milk soap, Coconut Oil, floating Noah's Ark Soap, free recipes, free soap recipes, germall plus, goat's milk, goats milk soap, how to make soap, how to use mp soap, ingredients in goat's milk melt and pour soap, melt and pour soap, mp soap, myristic acid, natural preservatives, natures garden, palm oil, purified water in soap, raspberry zinger bath fizzies, sodium cocoate, sodium myristate, sodium stearate, solid sugar scrub, sunflower oil, titanium dioxide, vegetable glycerin, what is goat's milk, what is sodium cocoate, what is titanium dioxide, what is vegetable glycerin on January 26, 2015 by Deborah Ward. Hi everybody! Hope you’re all having an awesome day! For all you melt and pour soapers out there, what is your favorite kind to use? Maybe it’s Shea Butter or Diamond Clear? Have you ever tried our Goat’s Milk Soap? This is one amazing melt and pour soap, and one that you should definitely be using for any upcoming projects and creations you may be working towards! Goat’s Milk is a wonderful kind of melt and pour soap, and one that we just happen to have many free recipes for! Make sure to try all of these out as soon as possible! Are you curious as to all of the ingredients in Goat’s Milk soap? Allow me to explain! Goat’s Milk melt and pour soap includes the following: coconut oil, palm oil, titanium dioxide, sunflower oil, purified water, sodium cocoate, sodium myristate, sodium stearate, vegetable glycerin, Germall Plus, and of course goat’s milk. Each of these ingredients brings its own special purpose to the soap! Coconut Oil: Coconut oil actually helps to soften and smooth your skin. Palm Oil: Palm oil helps to bring a great lather to the soap as well as working to help harden the soap. It also helps to remove oils and dirt from your skin. Titanium Dioxide: Titanium dioxide works to whiten the soap and can sometimes be used as a wonderful sunscreen, helping to protect the skin from any harmful UVA and UVB rays. Sunflower Oil: Sunflower oil is great for treating many skin conditions like eczema and acne. It also works to help the skin retain moisture. Purified Water: Purified water is another great treatment for skin conditions, helping to treat psoriasis, eczema, and acne. 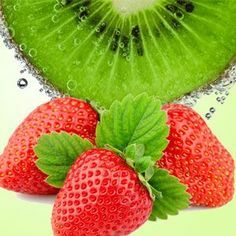 It also helps to hydrate and soften your skin. Sodium Cocoate: (derives from coconut oil) Sodium cocoate works as a surfactant, helping to cleanse the skin and making it easier to remove oils and dirt. Sodium Myristate: (the sodium salt derived from myristic acid) Sodium Myristate removes dirt and cleanses the skin, working as an emulsifying agent. Sodium Stearate: (the sodium salt that comes from stearic acid) Sodium stearate works as another surfactant to make it easier to remove dirt and grime. Vegetable Glycerin: Vegetable glycerin keeps the skin moisturized and cool, and also pulls in oxygen. Germall Plus: Germall Plus works as a natural preservative for your soap. Goat’s Milk: Goat’s Milk helps with treating many skin conditions like acne, reduces inflammation, and soothes damaged and dry skin. 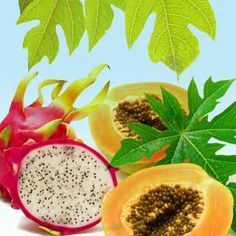 It also softens the skin as well as working as a natural moisturizer. Are you just dying to try out our Goat’s Milk soap now? Check out some of our awesome recipes made with our Goat’s Milk soap! When you go to our Goat’s Milk Melt and Pour Soap page, click on the little “Recipe” tab above the picture. This will show you all of our free recipes made with goat’s milk soap, like our Floating Noah’s Ark Soap, our Solid Sugar Scrub, our Raspberry Zinger Bath Fizzies, and many many more! Make sure to check out all the rest of our free classes and recipes as well! Please don’t hesitate to contact us here at Nature’s Garden if you have any thoughts, questions, or concerns, and keep watching for more Enlightened by Layla! This entry was posted in bath and body, bath products, melt and pour soap, Natures Garden, shea butter, soap, Soap making supplies and tagged 7 up bundt cake, animal print soap, clamshell kiwi sugar cubes, Coconut Oil, fish kiss soap, free recipes, free soap recipes, how to make soap, ingredients in melt and pour soap, melt and pour soap, natures garden, palm oil, purified water for skin, shea butter, shea butter for skin, shea butter melt and pour soap, shea butter recipes, shea butter soap, skin care benefits of shea butter, soap information, soap ingredients, soap making, soap recipes, soaping skin care, sodium cocoate, sodium myristate, sodium stearate, sugar cubes recipe, sunflower oil, titanium dioxide, vegetable glycerin, what is in melt and pour soap, what is palm oil, what is sodium cocoate, what is sodium myristste, what is sodium stearate, what is titanium, what is vegetable glycerin, zebra soap on January 23, 2015 by Deborah Ward. Hello all of you amazing people! I hope this finds you all having a fantastic day! For all you soap makers out there, what is your absolute favorite kind of soap to make? Maybe you’re more into cold process soap making, or melt and pour soaping, or maybe your favorite is even to make your own hot process soap recipes? No matter what your favorite kind is, each kind is unique and wonderful! Let’s talk about melt and pour soap right now, specifically Shea Butter Soap! This is one wonderful kind of soap that you’re sure to want to use as soon as possible! Are you wondering about the ingredients in our Shea Butter Soap? Well, let me tell you all about them! Shea Butter melt and pour soap contains the following: vegetable glycerin, titanium dioxide, coconut oil, sodium stearate, sodium myristate, palm oil, sodium cocoate, purified water, sunflower oil, and shea butter. 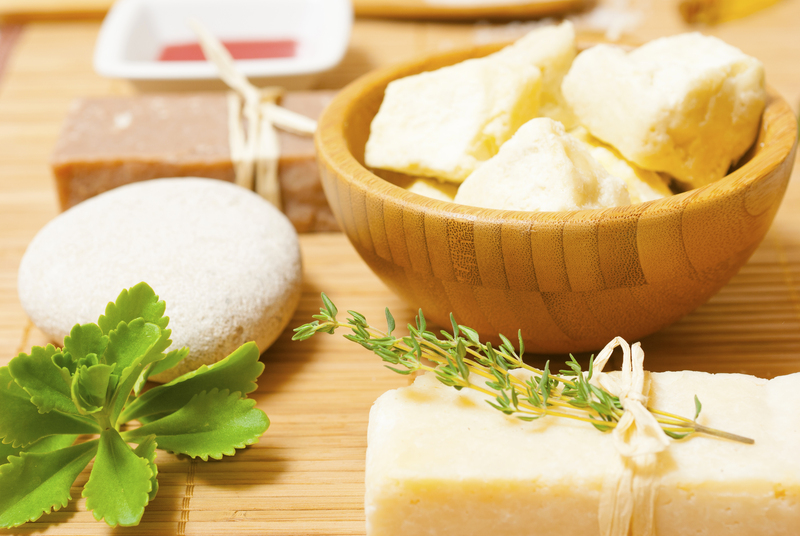 Each of these ingredients bring their own special benefits to your skin when used in soaps. Vegetable Glycerin: This helps to cool the skin, pulls in oxygen, and retains moisture in the skin. Titanium Dioxide: This is will whiten soap. 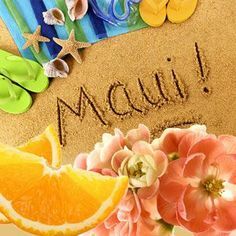 Also, it is sometimes used to help protect the skin from harmful UVA and UVB rays, working as a great sunscreen. 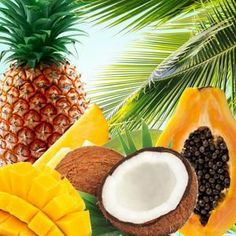 Coconut Oil: Coconut oil helps to smooth and soften skin. Sodium Stearate: This ingredient is the sodium salt that comes from stearic acid. 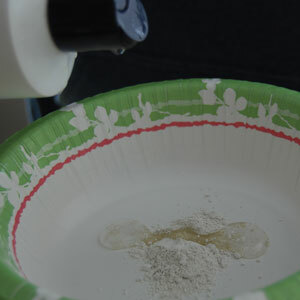 It works as a surfactant, and emilsifying agent, and helps to thicken the soap. Sodium Myristate: This ingredient is the sodium salt derived from myristic acid.This works as an emulsifying agent, also helping to cleanse the skin and remove dirt. Palm Oil: Palm Oil helps to remove oils and dirt from the skin, as well as working to restore natural oils within the skin. Sodium Cocoate: Sodium Cocoate derived from coconut oil, it helps to cleanse the skin and works as a surfactant, helping to make it easier to remove dirt and grime from your skin. Sunflower Oil: Helps to retain moisture in the skin, as well as helping to treat conditions like acne, eczema, and psoriasis. Purified Water: Purified water helps to soften and hydrate the skin, as well as working to treat eczema, dry skin, psoriasis, and many other skin conditions. Shea Butter: Shea butter works to hydrate the skin, as well as working as a sunscreen, helping to heal cuts and burns, and helps to treat wrinkles and fine lines. Here at Nature’s Garden, we offer many free recipes and classes. Are you looking for some cool new projects to try using Shea Butter Melt and Pour Soap? Well, when you’re on our Shea Butter page, make sure to check out all of our awesome recipes under the Recipe tab on top of the picture! I recommend our Zebra Print Soap…but what can I say? I’m a sucker for animal prints! We have many others as well, like our Fish Kiss Soap, our Clamshell Kiwi Sugar Cubes, and be sure to try out our delicious looking 7 Up Bundt Cake Soap! These projects and creations will definitely be ones that all of your friends, family, and even your customers will love and adore! These are definitely ones that you can’t pass up! Enjoy this wonderfully amazing soap and keep watching for more Enlightened by Layla!